Mark spent most of his career in Customer Service Management, but his real passion was his love for animals, particularly dogs. Mark has a great gift for taking an ill behaved, sometimes aggressive dog and turning him into a big old teddy bear. companion learns that good behavior will be positively rewarded. Mark teaches the dog, but he also teaches the owners and their family members how to interact with their pet so that they can be comfortable and happy with their furry companion. Mark is a writer and contributor for the Rochester Woman’s Magazine. The publication is distributed in the Rochester, NY area. Mark’s articles are based on behavior, nutrition and safety for your canine companion. Mark has also been an advocate for animal rights and involved with the Beverly Animal Shelter in Waterloo, New York, Verona Street Animal Shelter in Rochester, NY and the Cracker Box Palace a large animal rescue shelter in Alton, New York. Mark is a graduate of Animal Behavior College (ABC) with a certificate in Dog Training, Pet Massage and Veterinary Assistant. As a graduate of ABC his philosophy is based on positive reinforcement, counter conditioning and motivation, to build a long lasting relationship between human and his best friend! Whether you are just embarking on a dog training career, a seasoned industry veteran, or just trying to decide how best to add a dog to your family, the APDT is where you will find the advice, support, and training you need. 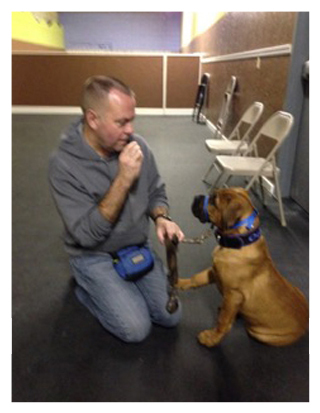 Mark currently serves on the Board of Directors for the Association of Professional Dog Trainers. The Canine Good Citizen (CGC) program, established in 1989, is an American Kennel Club program to promote responsible dog ownership and to encourage the training of well-mannered dogs. A dog and handler team must take a short behavioral evaluation of less than half an hour; The evaluation consists of ten objectives. Dogs who pass the evaluation earn the Canine Good Citizen certificate, abbreviating it as CGC; for example, “Fido, CGC”. Mark is an Evaluator 66603 for this program. The Pet Professional Guild is a membership organization representing pet industry professionals who are committed to results based, science based force-free training and pet care. A steward of the science based, results based force-free message, philosophy and training practices. We represent Veterinarians, Veterinarian Technicians, Behavior Consultants, Trainers, Dog Walkers, Pet Sitters, Groomers across many species.